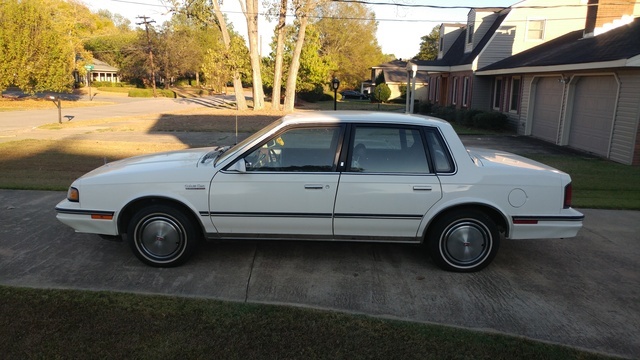 Have you driven a 1987 Oldsmobile Cutlass Ciera? Displaying all 2 1987 Oldsmobile Cutlass Ciera reviews. I named this car Bud; after the grizzled retired railroad worker I bought it from. Bud lived up to the Car & Driver maxim that nothing runs bad longer than a GM product. The sagging ceiling liner complimented the interior; its cigarette-burned velvet sofa seats and plastic walnut wood trim made it a celebration of man-made materials or a south-side gentlemen's club. Bud had issues with his doors. They would either cease opening altogether or would not close at all This led me to imaginative uses of ropes and knots tied around the roof pillars to keep the doors closed; or having the door panels in various states of disassembly so that I could dislocate my shoulder by reaching around the ragged, rusted frames to unlock the door. Bud had a problem holding his drink. The leaky fuel injectors would fill the interior with fumes, and I would always arrive to work smelling of 87 octane no matter how many cherry air fresheners I would hang from the rearview mirror. And boy did Bud rust. The salt and third world roads of Upstate New York had conspired to reduce the Detroit iron to its basic elements. I would have rust pelting matches with my brothers - you could get the biggest chunks from the trunk lid. But, Bud was good to me. I drove Bud to and from Vancouver, British Columbia; allowing me to experience exotic locales like Moose Jaw, Saskatchewan and Walls Drug, South Dakota. Bud was like that 30 year-old alcoholic former high school buddy of yours: you could count on getting from point A to point B, but don't ask him about getting to point C.